Classic double-bill, starring Gary Cooper. In A Farewell to Arms (1932), Frederick Henry (Cooper) is an American serving as an ambulance driver in World War I. When his friend Captain Rinaldi (Adolphe Menjou) introduces him to the beautiful English nurse Catherine Barkley (Helen Hayes), Frederick immediately falls for her. 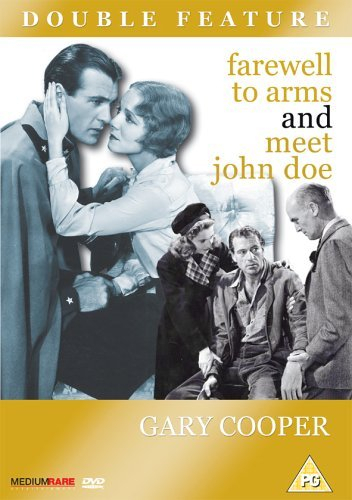 Meet John Doe (1941) is directed by Frank Capra. After penning a letter of protest at the corruption and hypocrisy of the day and threatening to throw himself off the roof of City Hall, 'John Doe' becomes a national hero. Doe is in fact Ann Mitchell (Barbara Stanwyck), who was fired from her job on the paper and wrote the letter as a parting shot to the editor. Mitchell is re-hired - but needs to find someone to play 'John Doe'. She manages to persuade Long John Willoughby (Cooper), a penniless former baseball star, into representing the working man in a national goodwill drive. He eventually exposes the political chicanery, but at a cost.